ByRominaPerez: A Perfect Red: Empire, Espionage and the quest for the Color of Desire. A Perfect Red: Empire, Espionage and the quest for the Color of Desire. While on the subject on reading about colors,here is another great read about the color RED. 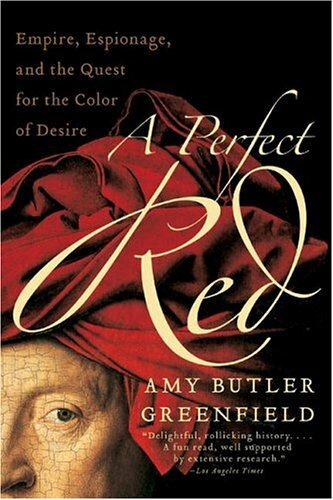 "A Perfect Red: Empire, espionage and the Quest for the Color of Desire" by Amy Butler Greenfield. The book is about the Cochineal or Grana Cochinilla as it's said in spanish.If the word seems familiar to you it may be because I have experimented and talked about such pigment HERE. Cochineal is a small insect that lives and feeds off cacti and is the source for the dye carmine. It is mostly found in southern mexico and in certain countries of South America. Like the cover of the book says, who knew that behind such a small insect lay stories of an empire, espionage and a quest on discovering the source of the perfect color red. The book begins with an introduction on the importance of colors to the dyers and to society, and how the most desired color was red, and even more when the carmine red of the cochineal arrived as the brightest red everyone has ever seen. It is from the discovery of the cochineal by the conquistadores that the true amazing journey of the cochineal in the old world begins, it covers all from its beginning, to the growth of that empire, and how that red empire met its biggest challenge and how it affected its future. If you are fan of history, adventure, espionage, conspiracies, secrecy,colors and science this book has it all. Another great book that I plan to add to my favorites.